Clog dancer and teacher from Barrington, Northumberland. Brother of Norman Hunter and pupil of Dickie Farrell. Rip Dodds – in about 1920. Betty Hunter – his daughter, the only one of his children to dance. Herbert Turner – in 1935. 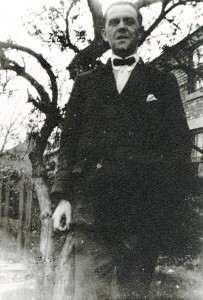 Tommy Makepeace – about 1920-1925. Ivy Sands (nee Anderson) from 1925 to 1930. Priscilla Spencer – about 1936. Unknown girl from Ashington in about 1920. He charged 1/- a lesson (now 5p) in the 1920s. Taught a Single Hornpipe, Double Hornpipe and competition steps all in hornpipe or schottische rhythm. Also a Sailor’s Hornpipe in clogs. Possibly made up material in addition to steps he had learned from Dickie Farrell. He apparently also danced on a pedestal.